The recently released final Cherry Sheet state aid estimates project an additional $1.2M in net state aid revenue for the City’s $2.9B FY16 operational budget. That will help the City, but the state budget continues a pattern of local aid growth for Boston being outpaced by growing state assessments, which reduces available revenue for the City. 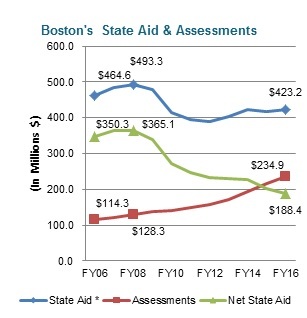 Over the past ten years, Boston’s state aid, net of teacher pension payments, has decreased by $41.4M or 8.9%, while state assessments increased by $120.6M or 105.4%. The result has been a decline of net state aid (revenue less assessments) available for operations of $161.9M or 46.2%. State aid in FY16 is the second largest revenue source for the City at $423.2M or 14.8% of total revenue. Nevertheless, gross state aid over the four years since the low point in FY12, has increased by $32.8M or 8.4%, while over the same period the City’s General Fund expenditures increased by $455.0M or 18.9%. The FY16 city budget assumes state aid growth of only $4.8M or 1.1%, while the City’s total operational revenues are expected to increase by $121.8M or 4.5%. Boston’s Chapter 70 aid for education has grown by only $9.0M or 4.4% over the last 10 years, while BPS spending has increased by $295.7M or 41.2%. State aid numbers are net of teacher pensions because the state reimbursed the City for teacher pensions in FY06 and starting in FY10 assumed full responsibility for paying Boston’s teacher pensions, as it had been doing for all other municipalities. The actual amount of state aid available for city operations is reduced by the amount of state assessments or charges for services provided by the state or its authorities. Assessments for MBTA services and charter school tuitions comprise the bulk (98%) of Boston’s state assessments. The charter tuition assessment has increased by $103.4M or 235.3% over the last ten years due to charter seat expansion. This growth is partially offset by the charter tuition reimbursement. However, this reimbursement is subject to appropriations and in FY15 only 63.5% of the obligation was funded for a revenue loss of $12.2M for the City. As a result, the City has become increasingly reliant on own-source revenues, such as the property tax, excises taxes, fines, and fees in order to fund city operations. Property tax revenues now represent 67% of total operating revenues. Excise taxes are the fastest growing revenue source over recent years, but only represent 11% of the total General Fund revenue.